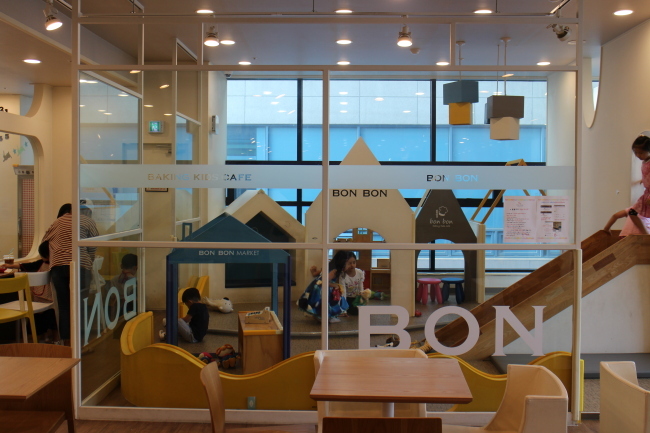 For tired parents and bored children, kids cafes have become a top option to spend family time in Korea. Since the concept was first introduced into the country in the late 2000s, the themes of the cafes also have evolved. Most kids cafes these days feature specific themes, such as racing, swimming and crafting. Baking kids cafes are part of the fast-growing kids cafe businesses in general, targeting children and their parents. 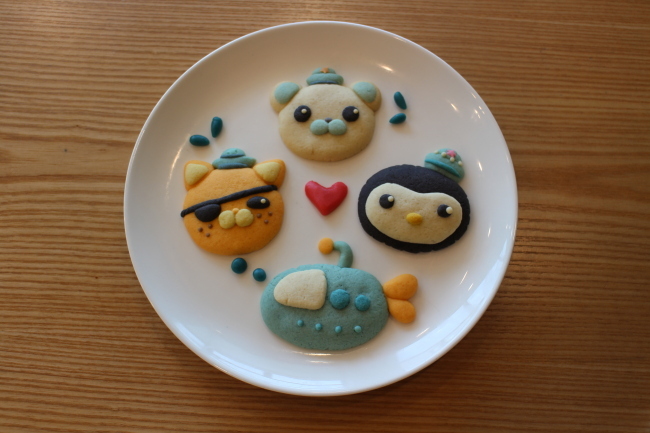 Besides indoor playgrounds and toys, baking cafes are equipped with baking studios specially designed for children. Equipped with small sinks, tables, cookware and ovens, the studios let the kids bake their own bread. 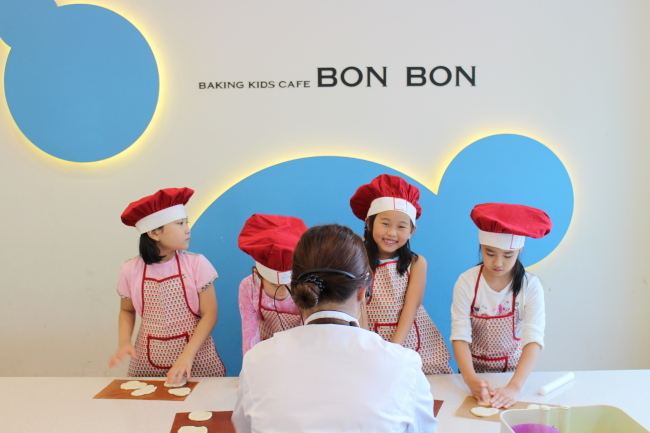 Last Thursday afternoon, four kids were busy making dough in the BonBon Kids cafe’s baking studio. Clad in red aprons and hats, the 7-year-old girls cut different colored dough into small portions and rolled it into shapes needed to make up imitation sushi portions -- pink shrimps, yellow omelets, white blocks of rice, and black dough for laver strips and eyes and mouth shapes. During the 25-minute class, an instructor was on hand to help them to follow the steps and put their creations into the oven, but the kids managed to complete most of the tasks on their own. To attract the young customers’ interest, Go and the cafe’s pastry chefs hold a meeting every Tuesday to develop easy and fun recipes. As the cooking class changes every week, Go sends the monthly plan to parents via Kakao Talk and posts it on a local online community. “The sales change depending on the popularity of the menu’s characters,” Go said. 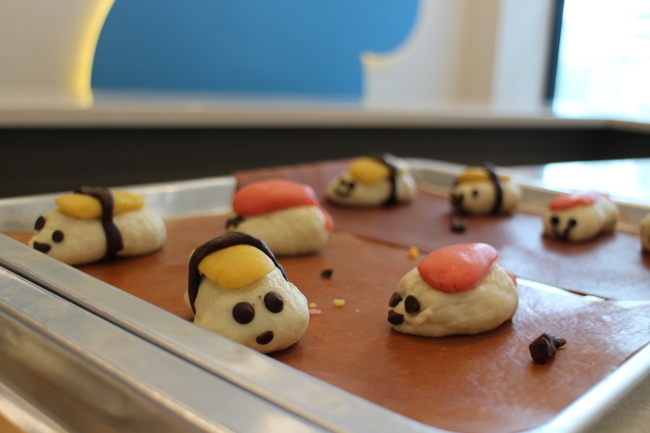 When the cafe opened the “Minions Bread” baking session last month, the numbers of participants doubled. While their kids focus on making bread, parents can either watch the session through a glass window or enjoy a short tea break at big tables placed in the cafe. The cafe offers a diverse menu for adults as well, such as coffee and cakes. “If I stay at home with my kids all day, they kept asking me to do this and that. In the cafe, however, mothers can take rest while they spend time with friends and instructors,” said Kim Mi-young, whose child attends the baking class. Kim also stressed the difficulties of cooking at home with kids. “My daughter loves baking, but it takes too much time and effort to cook with them at home. I had once tried to bake bread with my kids, but it left an awful mess in the kitchen. In the baking cafe, however, I don’t have to worry about cleaning it up,” Kim said. As the benefits of the baking kids cafe gained attention among some mothers, customers mostly come in groups. Oh Ju-young and Kim Seo-young, whose daughters go to the same day care center with Kim, accompanied Kim Mi-young after the center closed. The cost per session, 12,000 won ($10), is not cheap, but the mothers said it was worth it. “When considering the cost of purchasing ingredients and cookware, it’s a reasonable price. Also, the mothers can share information and relieve stress by talking with other parents,” Oh said. The three said they had already signed up for a package deal for 10 sessions. As the class was over, the girls came out from the studio and ran to the mothers to tell what they made. As the instructor gave out the baked bread from the oven, the kids took a mouthful of sushi-shaped bread with a big smile on their face. “We will come here again after two weeks when the ‘Pororo Bread’ class opens. The kids would never let us miss the class,” Kim Mi-young said.